Start-up company Deepfield Robotics has developed a field vehicle that can distinguish weeds from useful crops and eliminate them. The technology, called Bonirob, can not only make farming more efficient, but it can also reduce some of its environmental impact. About the size of a small car, Bonirob can do a host of things to make farmers’ life easier, by monitoring how well new crop varieties grow, if there is any pest damage, and how much fertilizer and water they need. Currently, samples need to be taken and brought back to the lab for analysis. But perhaps even more impressive, the robot can distinguish between crops and weeds according to the shape of their leaves and destroy the weeds mechanically by slamming them into the ground, rather than chemically. Unwanted plants are simply slammed into the ground with a rod. Several pictures are uploaded in the robot’s memory, which then uses machine learning to accurately identify them, even in difficult conditions or when they are partially covered by other plants. The robot then gets better and better at identifying them. 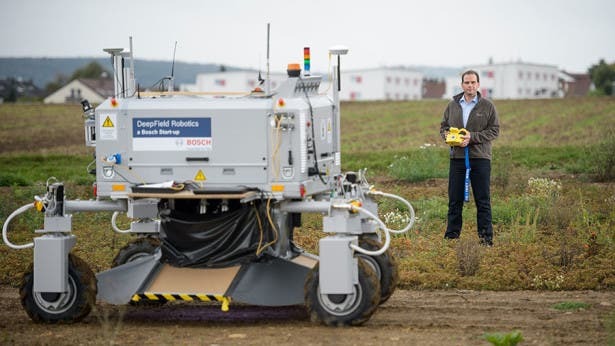 Bonirob is the result of a public joint project funded by Germany’s Federal Ministry of Food and Agriculture, in collaboration with Bosch and the Osnabrück University of Applied Sciences.